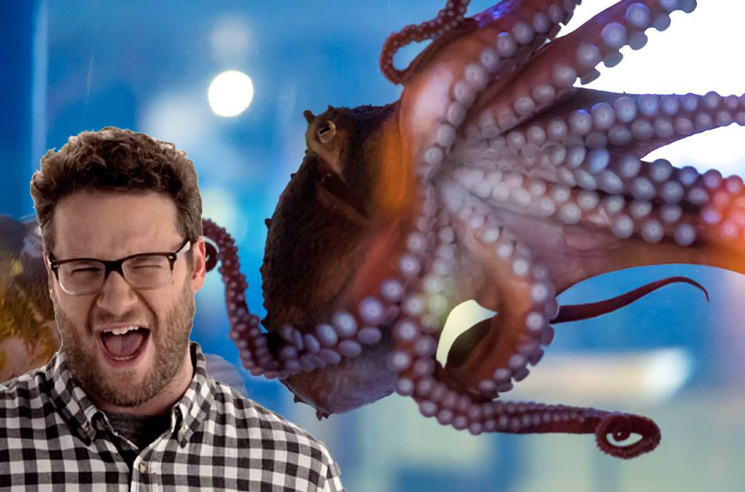 After becoming the voice of Vancouver's transit system this past summer, Seth Rogen is now poised to leave his mark on the Vancouver Aquarium by having an octopus named in his honour. The aquarium is holding a online contest to name a new giant Pacific octopus, letting internet denizens pick between the punny "Ceph Rogen" (for cephalopod) or the more immediate "Octavia." The Facebook poll, which is set to close in 21 minutes as of press time, currently shows "Ceph Rogen" running away with a clean 90 percent of the vote. You can quickly cast yours here. UPDATE (11/9, 3 p.m. EST): As expected, the octopus has officially been named Ceph Rogen. It really happened. @SethRogen, meet Ceph Rogen. Of course, a boost from Rogen himself didn't hurt, with the Canadian film star asking his Twitter followers to "please vote for me to have an octopus named after me at the aquarium I grew up going to." If we've learned anything from Rogen's recent stardom off of the silver screen, it's only a matter of time until Toronto comes calling.